This month we are featuring one of our video producers, Holla Toons. The creative genius behind this company, Alex Hollis, has been making original cartoon videos for ‘Bout Green for over a year. These short, animated videos offer our readers green tips in a light and informative manner. If you’re seeking to be more eco-friendly, head to ‘Bout Green daily and every other Friday for the videos. Without further ado, please allow me to introduce Holla Toons! 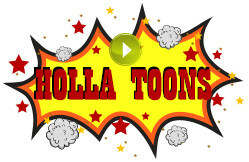 MPK: Our readers know you simply as “Holla Toons”. How did you get started making cartoon videos? HT: When running fellow portfolio company, TestSoup, we were implementing as many strategies as possible to try to increase conversion. We tried an experiment where we added a quick video about one of the many products we were selling, and we noticed that it not only lifted conversion considerably, but was also a fantastic traffic referral tool, as it was getting lots of views on YouTube. We wanted to replicate this for all of our products and realized we needed to go “all-in” on a cool video-creation tool and settled on a great product – PowToon. Our team was then pumping out at least one video a day and seeing pretty great results from it. Other portfolio companies liked the videos, and so I started helping them out by doing a few for them on the side. MPK: What is the best part of making these videos? MPK: What’s the story behind the business name? HT: When I was a teacher in Mississippi, my students’ accents forced them to pronounce my last name (Hollis) name as Holla. It just kind of stuck. MPK: You have covered an interesting assortment of green tips. How do you get the inspiration for each video? HT: A lot of them come from my dad, actually. He is very energy-conscious and is always making sure everything is as efficient as possible. HT: I have a small Yorky-Poo named Sophie. She is the bomb.